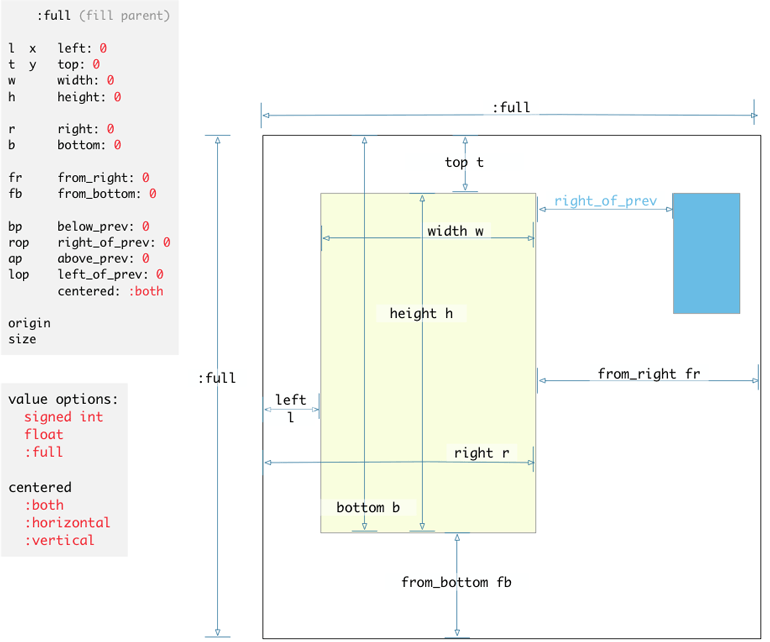 RMQ is a RubyMotion Front-end Library. It’s fast, non-polluting, non-magical, and chaining. It’s like jQuery for RubyMotion plus templates, stylesheets, events, animations, etc. It’s designed to be lightweight and highly performant. You can use as little or as much of RMQ as you like. You typically do things the standard SDK way, using RMQ to streamline the tedious parts. RMQ doesn’t require any other wrapper or gem. Clone this repo and run the example app to see an example of use. The main command is rmq and you use it everywhere. rmq by itself is the rmq instance of the current UIViewController if you’re inside a UIViewController. If you’re inside a UIView you’ve created, rmq.closest(UIControl) is the same as rmq(self).closest(UIControl). Because of this, you never have to check if your selectors return anything before calling actions or other methods on your rmq object. Moving around the subview tree. These four could be thought of as Selectors, not Traversing. They kind of go in both, anywho. Filter is what everything else uses (parents, children, find, etc), you typically don’t use it yourself. Some events fire asynchronous actions, or require some kind of delay between their next events. RMQ supplies a debounce option that will allow you to stammer events. puts "I won't be mashed and crashed!" all return another rmq instance, so you can chain. RMQ provides a variety of ways to update a view’s data or attributes. All of which are chain-able. You can use .data to either set or retrieve the “data” of the selected views. Depending on the view type, it will be the most common attribute, such as .text for UITextField or .image for UIImageView. Added standard colors allow you to create your named colors, often in your app-wide application_stylesheet.rb or in any stylesheet’s application_setup method, for easy use and single point of change. 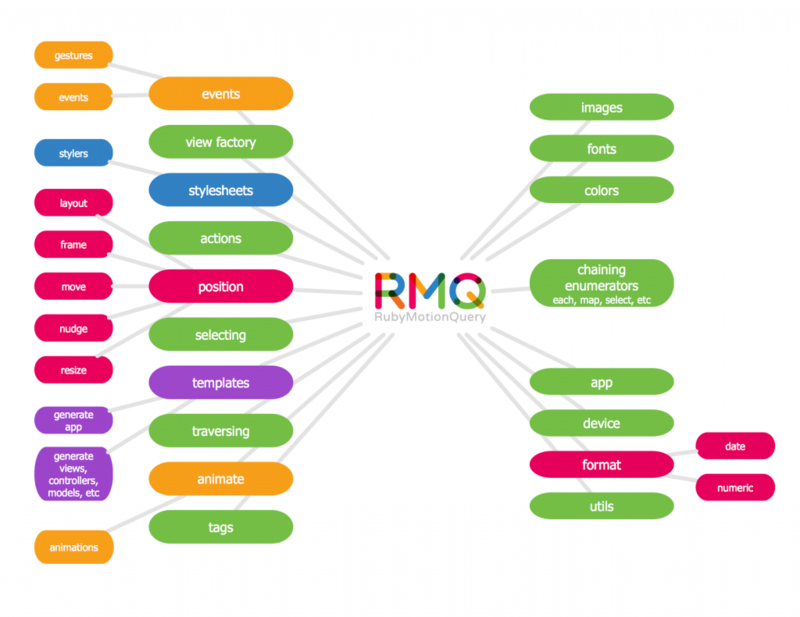 RMQ provides various features for dealing with images. Sometimes when you apply a background_image to a view you want the image to stretch to the size of the view without stretching the corners of the image, for example if you’re making a rounded button. The SDK has a nice feature for this, called UIImage#resizableImageWithCapInsets. It stretches the center of your image, but not the corners. The top, left, etc, tell which parts of the image not to stretch. You can now resize your view and it will look great. RMQ allows a RubyMotion validation library to help you to validate data in a way that makes life easy. All validations are tied to RMQ Debugging mode. 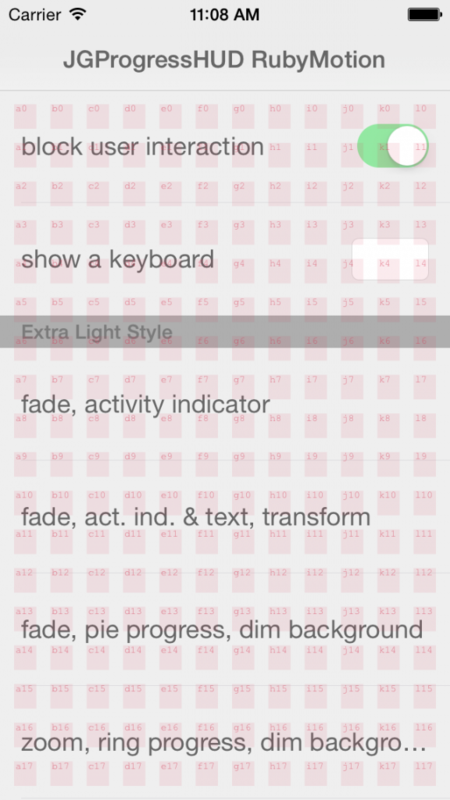 So you can turn them off in the application by entering debug mode. You can do so by starting your project with the flag set to true rake rmq_debug=true OR by setting the flag in the code/REPL with RubyMotionQuery::RMQ.debugging = true. This allows you to quickly disable validation in your entire application during debugging. RMQ Comes with a simple utility to validate common forms of data input. Each validation type can support options specific to that validation rule. Most of these are built from a collection of regular expressions that are fed into a regex_match? method. You can send a pull-request or use the custom rule to handle your own validations. By default all these tools are strict, but you can set the allows_blank option to true, which will cause a particular validation to return true IF it the input is blank. This can be useful in situations where data is optional. e.g. Only validate weight is numeric if they entered a value for it. Using the selection rules gets you a lot of validation help. You can attach and fire events on the UIViews in a block. puts "This field is valid"
puts "This field is invalid"
# blocks to run instantaneously with given input. email: "Please check your user email, and try again"
How do I add my own validations? There are a few excellent ways to add your own validations. If you simply need to make exceptions for existing validations, consider looking into using white_list. If you need to use your own custom regex or validation code, then the following 2 methods are extremely useful. If your validation is specific to a single form, we suggest taking advantage of using the custom validation rule. You can add your own validation with the add_validator method (Perhaps in your Application Stylesheet setup). Additionally, you’re not limited to the bounds of a single regex. You can use the ruby methods you know and understand, as well as multiple parameters passed in opts. If you find yourself needing a particular validation rule often, please patch back to RMQ’s default rules with a Pull Request! These are mostly used internally by rmq. Adding rmq_debug=true to rake turns on some debugging features that are too slow or verbose to include in a normal build. It’s great for normal use in the simulator, but you’ll want to leave it off if you’re measuring performance. rmq.debug.colorize – Often times, you may want high contrast on a selection of items, so you can lay them out or identify them on the screen. One common practice we use is to assign all the selected with a random background color. Since this is so common, we’ve created a shortcut method to help. This example applies layouts in the stylesheet (thus why it’s st.frame =), but you could also apply them using the .layout method. 8, 9, and 10 are interesting. I placed 8 on the bottom, then put 9 above_prev: 5, and then 10 above_prev: 5. You could do this differently, but that’s pretty slick. 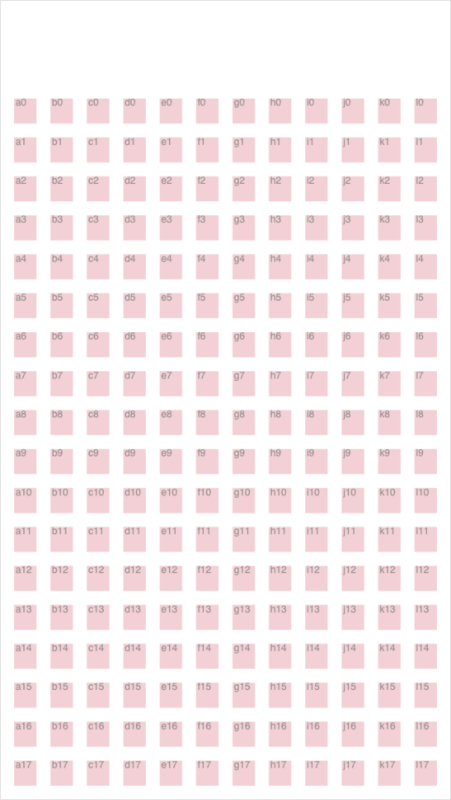 You can also have a grid per stylesheet. If none exists, the app grid will be used. 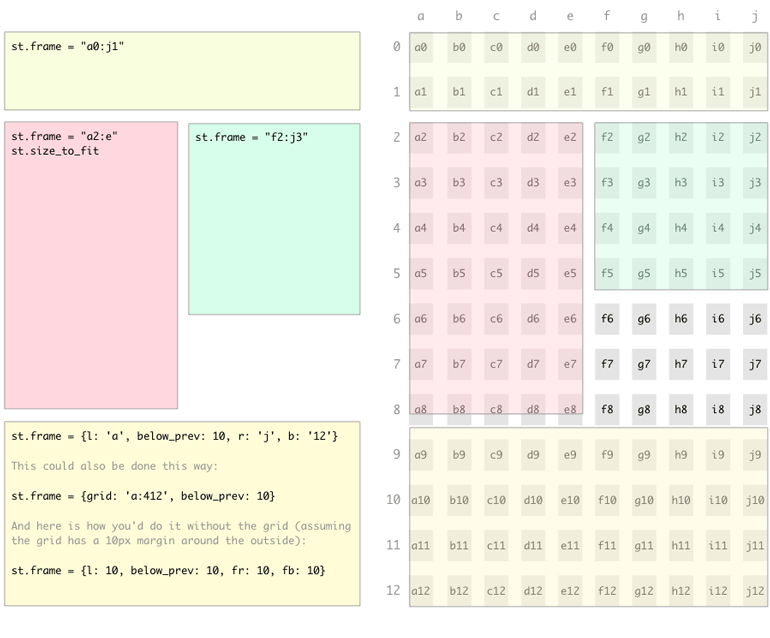 rmq.stylesheet.grid (this will return app’s if nil). 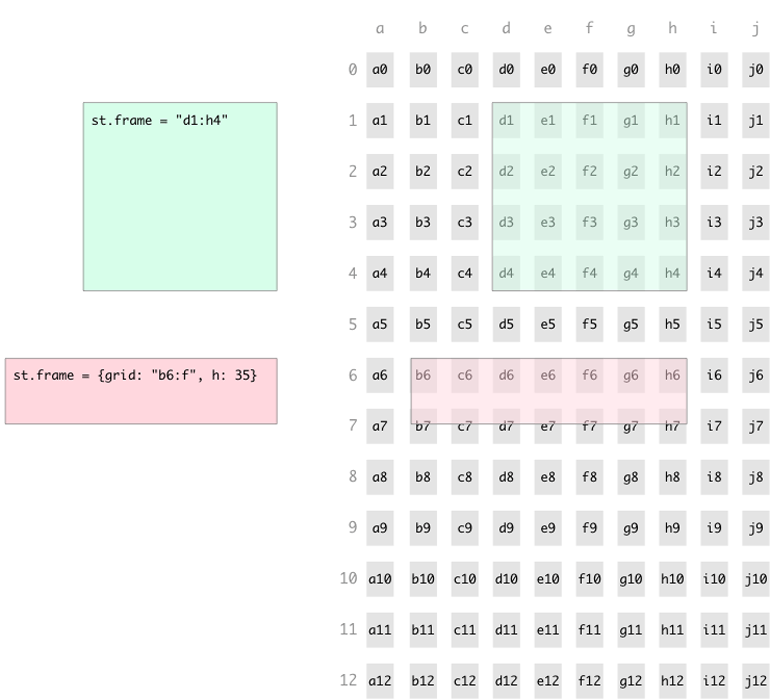 The grid applies to the entire controller root view. It’s always fullscreen. # 0 . . . . . . . . . .
# 1 . . . . . . . . . .
# 2 . . . . . . . . . .
# 3 . . . . . . . . . .
# 4 . . . . . . . . . .
# 5 . . . . . . . . . .
# 6 . . . . . . . . . .
# 7 . . . . . . . . . .
# 8 . . . . . . . . . .
# 9 . . . . . . . . . .
# 10 . . . . . . . . . .
# 11 . . . . . . . . . .
# 12 . . . . . . . . . . 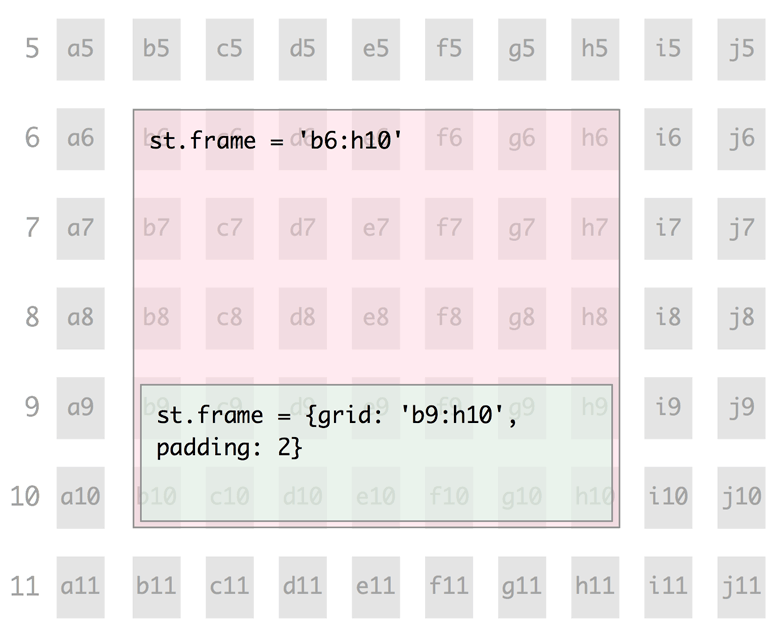 Padding is a useful when using grids. It adds additional padding, pushing a view inwards, it is applied after everything else is applied. A padding of 5 will take the frame and move all 4 sides inwards 5. You can set left (l), top (t), right (r), and bottom (b). 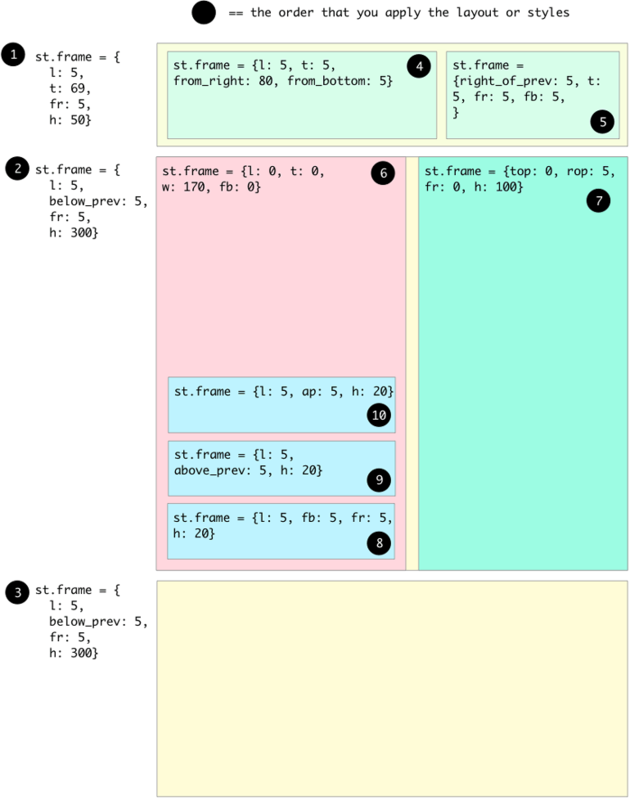 The RMQ Grid is an extremely useful and dynamic way to lay out views on a device screen. You want people to see the effects of your grid system, but not the grid itself. Fortunately RMQ has a quick way to turn on and off the grid overlay from the REPL. 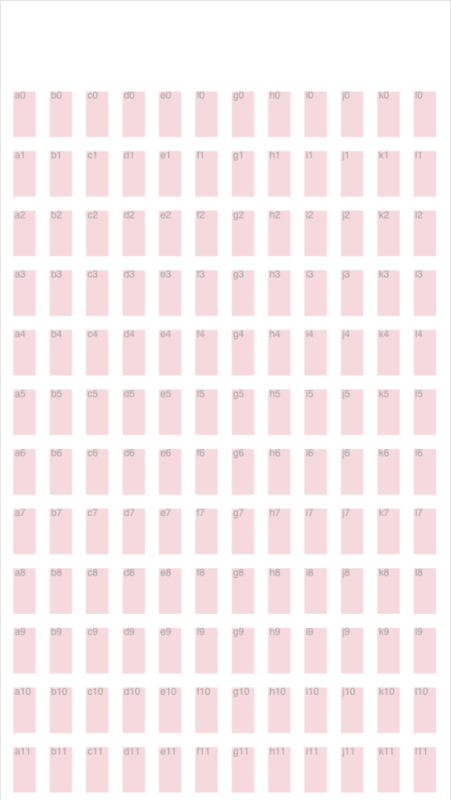 This allows you to quickly glance over the grid while accomplishing pixel-perfect layouts. A very lightweight style system, designed for a low memory footprint, fast startup, and fast operation. Most everything is done at compile-time, as it’s all just ruby code. Low magic. You’ll probably want an application-wide stylesheet. Simple create one, and then inherit it in all your stylesheets. 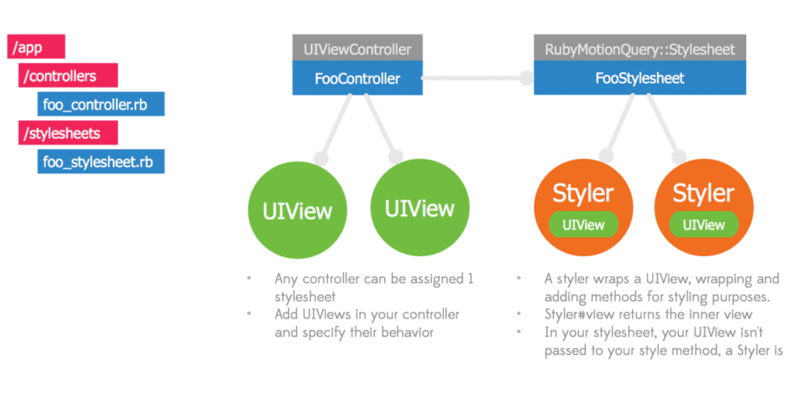 When you create a “style method”, it will be passed the view, wrapped in a styler. You can get the view using st.view. You can also include all of your custom stylers in one file, which works well if you don’t have a lot. I purposely used a variety of different things in this stylesheet to show different examples. In real life, I personally would use fr:, not from_right:. Both are fine, but I’d be consistent. 6 - I want to do X, how do I do it? How do I create my own custom view? order. This allows you to override subview’s styles. So the view’s author can style with good defaults, then when you add view to your view you can change them. How do I add my own styler? RMQ has plugins, there are only a few currently, but my hopes is there will be a lot more in the future. They are pretty easy to write. Created by Todd Werth at InfiniteRed. With help from a team of contributors. RMQ is available under the MIT license. See the LICENSE file for more info. The documentation is licensed under a Creative Commons Attribution-Share Alike 3.0 license. The videos are licensed by their respective authors. The RMQ logo, and other artwork are copyrighted by Todd Werth, all rights reserved.